New York is home to some of the best veg restaurants in the world. It is also the home of Moo Shoes, the largest vegan shoe and accessory store in the world. Sneakers, boots, heels and flats, Moo Shoes has every style of vegan footwear covered. Bags, belts, wallets and shirts are all available as well. Moo Shoes offers main stream brands such as Madden Girl and Saucony but they also hook it up with the vegan brands such as Olsen Haus and Big Buddha as well. 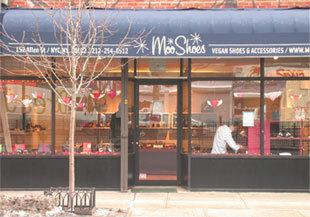 Moo Shoes is located on the Lower East Side in an awesome neighborhood that has tons of veg restaurants. This store is vegan owned and has been awarded many crowns by publications such as Veg News, for being awesome. They are also active in the vegan community and support all things cruelty-free. I can personally attest to the awesomeness that is Moo Shoes and all I can say is you gotta check it out for yourself. Moo Shoes. 78 Orchard Street. New York, NY 10002. 212-254-6512. Open 7 Days. Monday-Saturday, 11:30-7:30. Sunday, 12-6. Categories Fashion With Compassion., People, Places And Things.